Linux desktop comparison summary – 20 solutions for your desktop! Our first Linux desktop comparison is over. I took a look at quite some projects during the last weeks. 20 of those (including modes that are behaving differently) proved to be full DEs which should be covered by a broadscale test. Some others, like UDE for example, had to be skipped. While it does have a very interesting concept, it’s not currently a DE but only offers a window manager (despite the name “Unix Desktop Environment”). In the end 18 DEs were actually tested (I failed to get the other two to run on Arch). Comparing DEs over the time of several weeks on a rolling release system might not really wield the best results. I also wanted to add something new to this post so that it’s not just a boring summary for those who have read the past entries. Therefore I decided to add the size of the packages that are downloaded to install the DE, too. After all network traffic can still be an issue for some people. Well, and for some DEs new versions have been released in the meantime and I’d feel stupid to write a new entry by just warming up old stuff. For these reasons I repeated most of the tests last Monday and Tuesday and use the new values here (which sometimes make a huge difference!). Only CDE uses the old package; I was able to build a current package but did not succeed in making the DE start. Unity2d is now obsolete just like the old GNOME 2 (which I essentially added so that MATE can be compared to it, anyway). 18 Unity 2D 6.0.0 ?? The most light-weight DE tested is OpenCDE, based upon Motif. The second best is Equinox DE using FLTK as its toolkit. The lightest GTK+-based DE is LXDE, ranked No. 5 and the lightest Qt one Razor-Qt which scored rank 7. So these will be the candidates to examine closer in a future testing series. The next entry will deal with what Eerie’s last two letters stand for. This is the final part of our desktop testing series. We’ll deal with the rather exotic desktop environments in this entry. Most of them are built on top of some unusual toolkits. 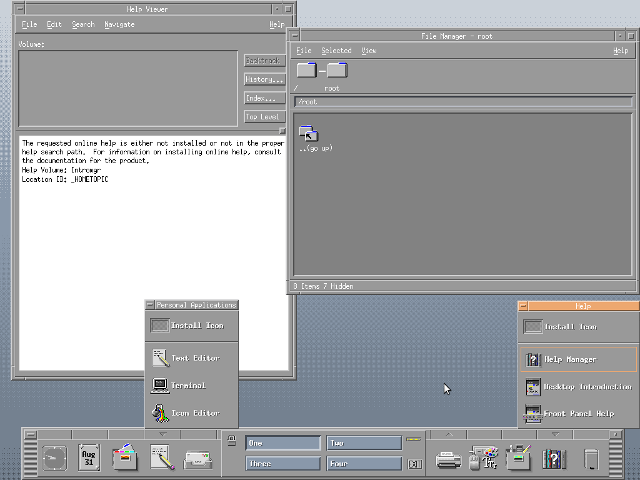 OpenCDE was a project to recreate the proprietary Unix desktop CDE. However the original CDE has been open-sourced recently and OpenCDE is likely to be discontinued since its developers joined the developement of CDE. It is however a very light DE but also quite incomplete. CDE or “Common Desktop Environment” is the original Unix desktop that was often bundled with retail Unix versions. It was quite innovative in its time but today it shows that the opened source code of the program is really dated (it was last worked on in about 1999). And while this DE is not extremely popular with Linux users, it does have a certain user base and is actively worked on again. It comes with the full load of tools that were part of the DE back then. 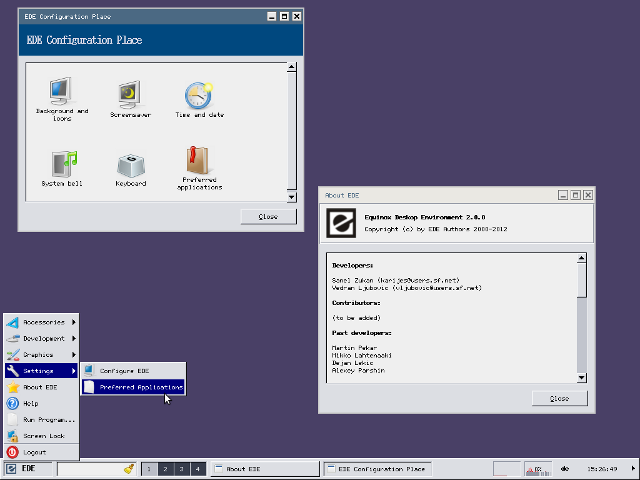 The Equinox Desktop Environment is the result of a project aiming to create an extremely light-weight DE. It has been around for a while but never got much attention. With version 2.0 released this year the project proved to be alive even though many people thought that it was already dead. This new version is a huge step ahead: EDE 2 is now fully FreeDesktop.org compatible. It just offers a simple DE – no more, no less. A very promising project! Étoilé aims to be a resource-saving, modular and easy to use DE. It uses the GNUstep toolkit and kind of resembles the Mac OS X style in many aspects. The last stable build is quite old now and the newest versions are not in usable shape right now (not even recommended by the developers). So if you like the idea of this DE, it’s more or less something to keep in mind for the future. I have not been able to compile and install it on a current Arch machine. The screenshot is from a modified Ubuntu version from 2009. It *might* be possible to get the DE to work with a current Arch system, but that would most likely be a lot of work and it surely is far beyond my skills. If anybody is up to that challenge – please tell me! I would be very much interested to get the last stable version 0.4.1 (spring 2009!) working! Mezzo was a DE that tried to go new ways. 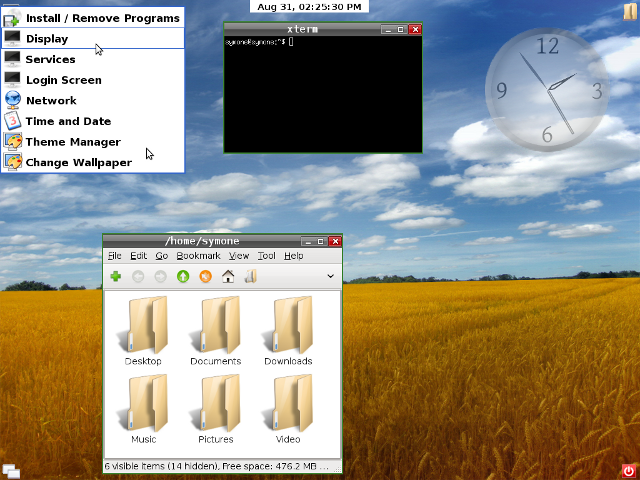 It places control icons in all four corners of the screen; system-related items are in the upper left, file-management in the upper right, restarting / shutting down in the lower right and applications in the lower left. It avoids nested menus and tries to abandon the concept “the desktop is a folder”. This innovative DE was developed as part of the now discontinued SymphonyOS and was never really available outside of it. I have not been able to compile and install it on a current Arch machine. The screenshot here is from the 2008 edition of SymphonyOS which was the only one I could still find on the net. There has been a 2011 release as well, but I had no luck finding it. Honestly, I have not even been able to even find the source code for Mezzo, the DE I’m actually interested in. Looks like it’s gone (which is a real shame). Perhaps it’s not gone for good? We have two DEs that could not be tested this time; Étoilé and Mezzo are interesting projects for sure but not available right now. OpenCDE is really tiny in every aspect – with less than 60 MB of RAM needed and just about 80 MB installed (including Xorg)! However it also doesn’t offer much and is most likely dead. CDE does well with little more than 70 MB of RAM. It’s quite old now but actively developed again – yet it’s uncertain if it can be turned into a modern DE without breaking the CDE concepts. And then there’s EDE 2. This one is very frugal with about 70 MB of RAM needed. A great DE with a classical feeling perfectly fit for systems with low RAM. The next entry will be a summary of all five parts of our test.